It glided by, quiet as a whisper. Electric cars dominated at the beginning of the 20th century, but began to fade due to the one factor that has plagued them to the very present: their range. The electric car manufacturers tried to overcome this with what I consider to be a brilliantly simple concept: battery exchanges. The idea is that you would pull into the station, they swap out your nearly dead battery for a charged one, and off you go. In those days, it was likely a clumsy effort to swap out the batteries, but I am guessing the variety was not impossible to manage for the stations. These days, the opposite is likely true. If something like this could be put into place, it would require car manufacturers to standardize on a minimum of physical battery configurations, and make them quick and easy to swap out (with easy removal and connection a must). If that seems impossible, remember that cars have standardized on 12VDC, on a handful of specific battery sizes and terminal types and positions, and on a standard cigarette lighter socket. Yes, the batteries for the modern electric car are bigger, heavier, and positioned in various locations in various vehicles, but it would be in car manufacturers' best interests if they got away from proprietary batteries and made them more of a commodity. It would require them to get together and hash out a standard (and the government could help with that), but it would open up a lot of possibilities and make electric cars more appealing. 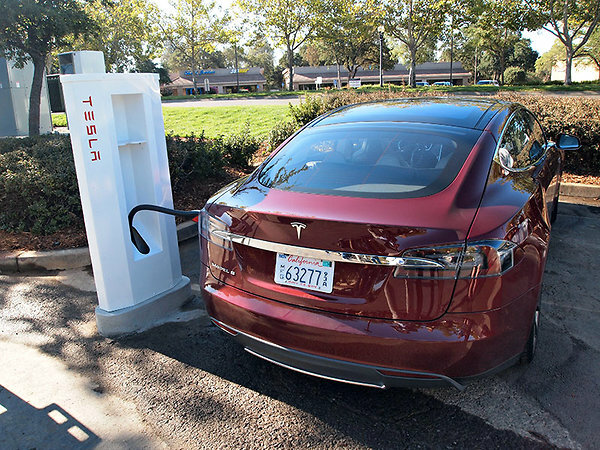 While driving a Model S with the biggest available battery pack � 85 kilowatt-hours � on a restrained run through Northern California wine country, I was able to wring 300.1 miles from a single charge. The E.P.A.�s rating for equivalent gasoline miles per gallon is 88 m.p.g.e. in town and 90 on the highway, with a 265-mile range. On a more enthusiastic romp from my home base here to Santa Cruz and back, I sampled what the 362-horsepower electric drivetrain was designed to do: bolt. Tesla says the car can zip from zero to 60 in 5.6 seconds and tops out at 125 miles per hour, but it was the silent, near-instantaneous bursts from 35 to 65 along the Pacific on California Highway 1 that best demonstrated the S�s otherworldly quality. I managed to make that 207-mile round-trip with about 25 miles of battery charge remaining when I pulled into my driveway. I never gave a second�s thought to range, batteries or kilowatt-hours. I just hauled amps. It�s probably best for my driving record that I didn�t test the performance version of the Model S, which raises the ante to 416 horsepower � and a 4.4-second dash from zero to 60 m.p.h. 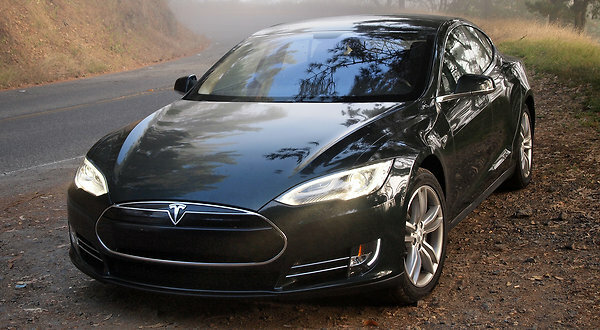 The Model S�s charging capability also figuratively cranks up to 11. With 50-amp service from a 240-volt outlet, I added back about 30 miles of driving for every hour of home charging. Highway fill-ups are even quicker for Model S owners using one of the Tesla Supercharger stations in the network announced last week. That's a little short on details, but it seems like an impossibility for a car company like Tesla to scale that up nationwide. It's also still likely to be impractical for a cross-country (or even cross-state) trip. After a few years of boom and bust, the electric car market has lately settled into a rut, as established automakers try to meet regulatory goals mostly with a few everyday models converted to electric power rather than designing all-new electric cars, leaving Tesla as the only independent, high-volume EV builder. Here's the first attempt to shake up that stasis, the launch of a start-up that will revive the century-old name of Detroit Electric cars � with a car that on paper looks much like a Tesla Roadster. The new Detroit Electric company revealed today after years of fund-raising and stealth engineering it would reveal its first model next month, a two-seat all-electric sports car that would be a harbinger of future models. The company will not just take Detroit as a brand but base its headquarters in the city, vowing to generate 180 jobs and open a Michigan plant that can build 2,500 vehicles a year. One hopes the product will cost less than the Tesla. One also hopes that they enjoy a better fate than the EV1. That car was unceremoniously killed by unknown forces, even though it was popular with those who leased them. There is speculation that the oil companies were behind its demise. Oil has indeed been "black gold" for a number of America's richest, including the Rockefellers, the Gettys, and the Mellons. Grand homes in Newport, RI, and other areas around the country are testaments to the riches to be had from oil. The greedy lying bastards of today are just as married to the 20th century enery technology that Edison eschewed 80 years ago, and the greatest inhibitors to adopting electric as the new (returning) standard for automobiles. It's way past time to let go of this usurper to the American energy technology and return to our roots. Electricity doesn't spill and foul waterways, it doesn't put carbon dioxide into the air, and it isn't cancer causing. We get so much more free energy from the sun every day than we can possibly use - we just need to convert it to electricity. That's the sticking point for the oil companies, though, isn't it? It's available for everyone to use. Unless they can figure out how to make a profit with it, then they will be against it. This time, though, we know their game. This time people are ready for a change. This time it's time for some follow-through.